When Does the Incumbent *Not* Get Held Responsibile for the State of Economy? I want to return to some points that kind of got buried (but were addressed in the comments section) of my post last week about the consequences of economic voting models for thinking about how a politically minded opposition ought to behave vis a vis the economy. I initially tried to point out what seemed like a fairly obvious point: if the opposition performs better when the economy is worse, then what incentive does the opposition have to take steps to make sure the economy doesn’t get worse heading into an election cycle? This then led to a discussion (picked up elsewhere as well) about whether the debt ceiling talks were sufficiently “different” than previous situations (and maybe similar to the Gingrich vs. Clinton government shut down of 1995) to suggest that Obama might not be held accountable for the state of the economy. Underlying this discussion, therefore, is a serious theoretical question: what are the conditions under which we might expect the link between the state of the economy and the vote for the incumbent candidate to break down? 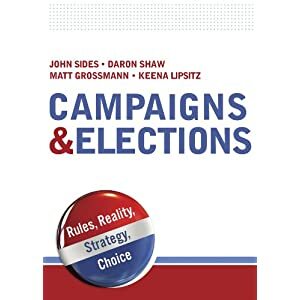 And here the political science literature does have some insights to offer backed by data analysis, many of which, interestingly, come from studies of elections and voting outside of the United States. Perhaps the best known argument is the “clarity of responsibility” hypothesis that was first posited in a 1993 American Journal of Political Science article by Bingham Powell and Guy Whitten. Powell and Whitten find support for the contention that – across 102 elections from 19 advanced industrialized democracies – there is stronger relationship between economic conditions and the vote for incumbent parties when the government is more “responsible” for the state of the economy. They define responsibility in terms of a number of institutional features, one of which crucially is divided control of bicameral legislatures, which would seem to be appropriate in the United States today. A whole host of papers have followed up on this initial study (see for example here and here); interested readers should just type “clarity of responsibility” into Google Scholar; see as well Raymond Duch and Randy Stephenson’s new book The Economic Vote. Election-year economic growth influences the vote of the major party in office, but fails to have an effect on the combined votes cast for all incumbent parties. My own work on economic voting in post-communist countries reveals a similar result: that there is more systematic effect on the vote for primary coalition members than junior coalition members. Of course, this particular line of inquiry is less relavent in the context of the United States. Most political support models imply that in evaluating economic performance, voters use a standard that would provide poor predictions of the future and leave the economy vulnerable to manipulation by vote-hungry politicians. Drawing on macroeconomic theory, we develop a simple standard of evaluation which encompasses a concern not only for current economic outcomes, but also for accurately assessed future consequences of current policies. We find that political support for the president can be explained as well as by models that assume that voters use this sophisticated standard as by models that assume voter naivete. Our analysis questions the wisdom of measures typically used to assess voter evaluation of economic performance in a variety of theoretical contexts. The results also help to explain the absence of convincing evidence that governments exploit voter ignorance in manipulating the economy. In a sense, this argument speaks a bit more closely to the situation at hand in regard to the debt ceiling, only the focus here is on the incumbent as opposed to the opposition. The logic is the same – can voters see through cynical political ploys by partisan forces to manipulate the economy for political gain – but still we can not claim to have found an empirical test that speaks to the question of whether actions by opposition parties can trigger what Chappell and Keech called “sophisticated standards”. How do voters assess the economic performance of their governments? Research on the economy and the vote almost exclusively assumes that voters treat their national economies as autarkic. We decompose two key economic aggregates, real GDP growth and unemployment, into their international and domestic components and demonstrate that voters hold incumbents more electorally accountable for the domestic component of growth than for the international component. Voters, in fact, benchmark national economic growth against that abroad, punishing (rewarding) incumbents for national outcomes that underperform (outperform) an international comparison. Moreover, it appears that this effect emerges not from voters actively comparing local and global economic performance but from the media, rival politicians and other information sources originally reporting economic news in a comparative context. The effect of benchmarked growth exceeds that of aggregate national growth by up to a factor of two and outstrips the international component of growth by an even larger margin, implying that previous research may misrepresent voter behavior and consequently underestimated the strength of the economy on the vote. The reason I think this could potentially be the most relevant to the current situation in the United States is because of the links between the Great Recession and possible chaos that could follow a US debt default. If Kayser and Peress are correct that voters were able to discount their punishment of incumbents because of matters that were out of their control (i.e., the global recession), then perhaps US voters will indeed discount Obama’s responsibility for economic problems that are seen to eminate from opposition policies (i.e., a refusal by the Republican House of Representatives to raise the debt ceiling). All told then, there are quite a few circumstances where we have evidence of factors that reduce the extent to which voters hold incumbents responsible for the state of the economy. What we do not have, to the best of my knowledge, is any direct study of whether the actions of the opposition party can undercut this link. If anyone has systematically tested whether there is a link between the behavior of opposition parties and the link between economic conditions and the vote for incumbent parties, please do not hesitate to share it in the comments section or email me directly. If not, then perhaps this is an interesting subject for future research. 2 Responses to When Does the Incumbent *Not* Get Held Responsibile for the State of Economy? along the lines of the OECD comparison, is there any research that speaks to relative voter sophistication across these countries? do we have reason to think that American independents are going to pick up on the same sort of cues that triggered these dynamics in other countries? also, as an add-on the question about research on the effects of the opposition’s actions, what about the actual opponent? does it matter if the opponent has uncharacteristically high unfavorables?